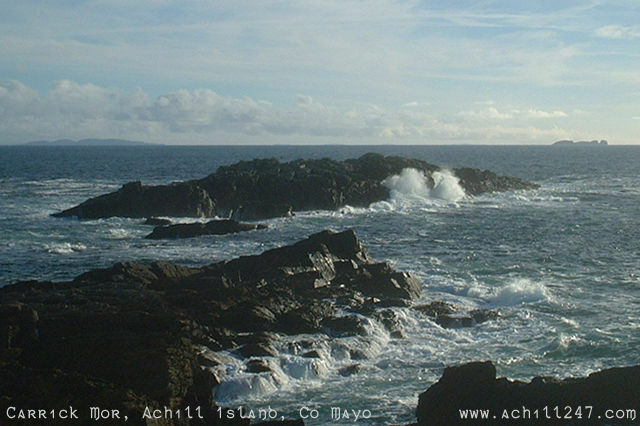 This image in Achill 24/7's gallery of Ireland pictures from Achill Island shows Atlantic waves breaking over the rocks at Carrick Mor, Achill. In the distance, to the left, can be seen Clare Island. In the distance at the right are the Bills Rocks. The Achill shoreline close to Carrick Mor is a popular spot with anglers, with catches including mackeral, pollack, wrasse and sea trout. It also offers a sea-level view into Keem Bay - click for a photo of Keem Bay seen from Carrick Mor.